Our busy family schedules make mealtimes such a challenge. Many quick-to-the-table options are on the unhealthy side, but there are some really healthy “helper” foods out there too. Try our picks for fast, sit-down foods that are good for your family. 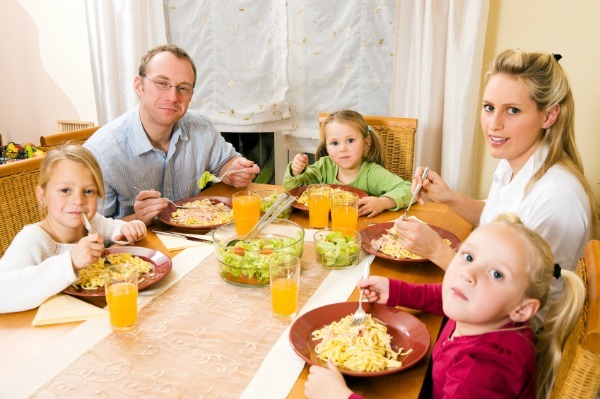 Our busy family schedules make mealtimes such a challenge. Many quick-to-the-table options are on the unhealthy side, but there are some really healthy “helper” foods out there too. When we’re short on time, we may feel as if we have no choice but to go short on nutrition with prepackaged and boxed foods. But not all boxed foods are alike. In fact, we’ve found some really healthy options that are easy to prepare and delicious to eat. Try them out on your family! The founders of cooksimple are striving to slow the growing trend of poor diet, nutrition and obesity by reducing the time required for healthy home cooking. The result: Inexpensive, appealing and easy-to-prepare cooksimple meal kits. Just add protein and you’re 30 minutes away from dinner! Award-winning cooksimple meal kits ($5, TheHealthyPantry.com) are packed with high-quality, all-natural ingredients — nothing preserved, nothing artificial. Choose from globally inspired dishes such as Punjabi Curry, White Bean Chili, New Orleans Jambalaya, Tamale Pie, Tibetan Dal and Cowboy Chili. One box makes four servings. Does your family like Asian dishes? Crazy Cuizine ($7, in Costco stores) is a line of authentic meals inspired by classic Japanese, Chinese and Korean recipes. 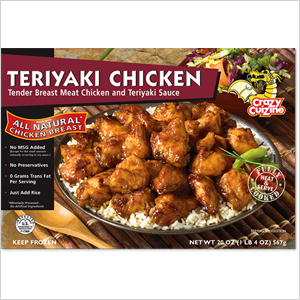 The fully-cooked chicken, beef and pork dishes are high in protein and free of preservatives, trans fats and MSG. In less than 15 minutes, your family will be enjoying Mandarin Orange Chicken, Teriyaki Chicken, Spicy Korean BBQ, Tangerine Beef or Pork Potstickers. Paired with your favorite rice or a side of fresh veggies, you have a quick, nutritious meal that’s perfect for those busy school nights. 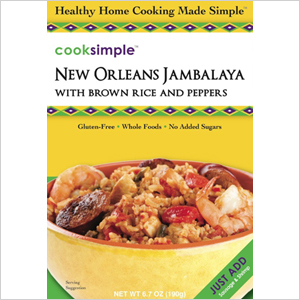 It doesn’t get much easier than this: Global Grub DIY cooking kits ($11, GlobalGrub.com) include the dry ingredients you need to make satisfying ethnic dishes such as red chili tamales, Jamaican jerk chicken and Moroccan tagine with cous cous. Each kit serves about five and provides a “shopping list” of fresh ingredients to buy and “pantry items” to keep handy. 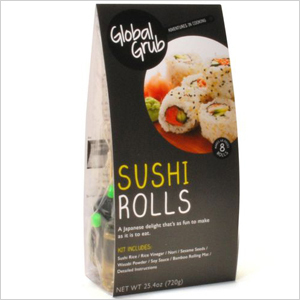 Let the kids help you roll the sushi, and you’ll all feel like international foods chefs! No soup for you! 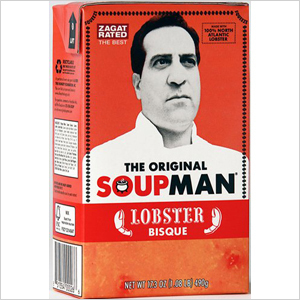 Just kidding… In fact, The Original SoupMan — made famous by Seinfeld — has soup (and much more) for you. The Original SoupMan soups come in eco-friendly Tetra Pak cartons ($3, OriginalSoupman.com) that feature quick and easy family recipes. Pour the all-natural tomato bisque over pasta or create mini English muffin pizzas. Or add turkey and chili powder to the delectable lentil soup to make low-fat turkey chili. For 25 years, Pacific Foods has been a leader in the natural foods industry. Now the company has added kid-friendly pasta meals to its line of hearty soups and bisques. 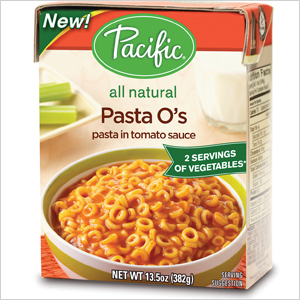 Like all of Pacific’s products, the pasta is packaged in BPA-free cartons that last for up to 24 months… perfect to keep on-hand for quick and easy dinner options. The ready-to-eat All Natural Pasta O’s and All Natural Mac & Cheese will appeal to you because they’re made with high-quality ingredients and without artificial colors, flavors or preservatives. They’ll appeal to your kids because they were designed with younger taste buds in mind! GoPicnic is doing its part to combat the obesity epidemic. 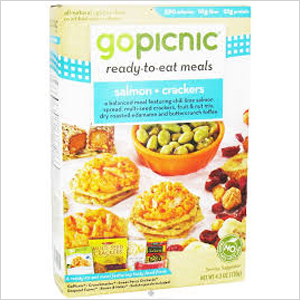 With fewer than 500 calories, each GoPicnic meal ($5, Target stores or Amazon.com) includes a protein, whole grains, fruit and a sweet treat — a healthy alternative to packaged foods that are high in fat, high in sodium and low in nutrition. GoPicnic offers a wide array of meal options including gluten-free, Kosher and vegan. You’ll also find meals for those fighting food allergies or who follow a special diet. And the foods are individually wrapped and require no refrigeration or preparation. Utterly convenient!